Chicken Cacciatore- There’s a First Time for Everything! 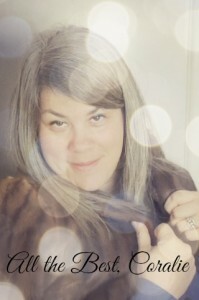 I was talking with Leigh the other day- we try to have a state of the blog meeting every couple weeks in an effort to make sure we are and continue to be on the same page as far as the FTTDWYW is concerned (and as far as life is concerned too). For these meetings, we try to go back and look and take stock of what we have been posting and so forth. There is no doubt that I have posted predominately from my kitchen this year- that’s gonna shift in the weeks to come. But, here’s the thing- Bub and I have been doing a bunch of cooking- so, that is naturally reflected in my posts. With that being said I want to share this recipe for chicken cacciatore. I was doing some menu planning and asked Bub if he had any requests for the next week and he was like, yeah- how about chicken cacciatore? And I was like, what is chicken cacciatore? And he said- no joke- whole fried chicken in marinara. Well, let me just whip that up Honey Bun! But, I diligently put it on the next week’s menu and start looking for recipes. I figured out that is not exactly a whole fried chicken in marinara but kinda in that neighborhood and decently healthy too! 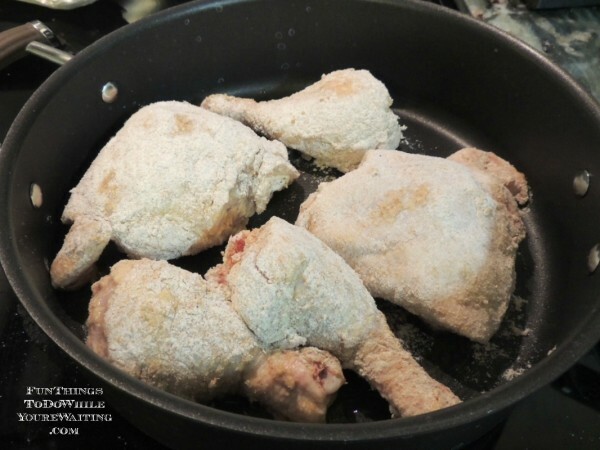 The first step is to sprinkle your (bone-in) chicken with salt and pepper (to taste) and then lightly coat in whole wheat flour and place in a warm skillet with 2-3 tablespoons of olive oil. The object is not to fully cook the chicken but to just brown it. So, while you have all that chicken browning going on- dice an onion and a red bell pepper and 3 garlic cloves. 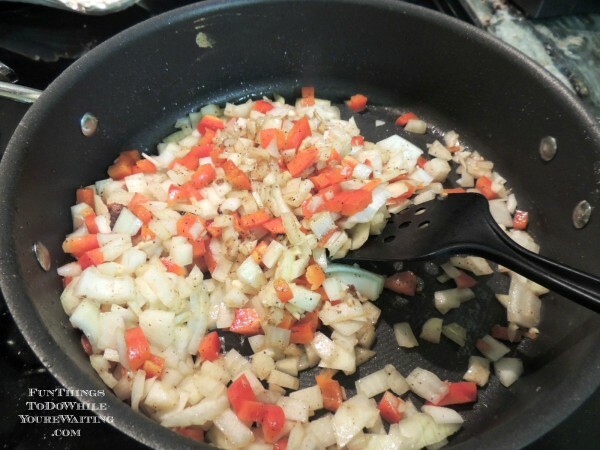 Once the chicken has browned, remove it from the pan and add the diced onion, bell pepper and garlic and sauté it over medium heat until the onions are tender. Next add 3/4 cup of white wine and let all that business cook until the wine has reduced by half. Then add a 28 ounce can of tomatoes and their juice plus 3/4 cup of chicken broth, 3 tablespoons of drained capers and 1 1/2 teaspoon of dried parsley and then return the chicken back to the sauce and let it simmer for 20-30 minutes until the chicken is cooked through. I have to say, for my first time cooking a dish I did not even know what it was until the week prior- it was off the chain! 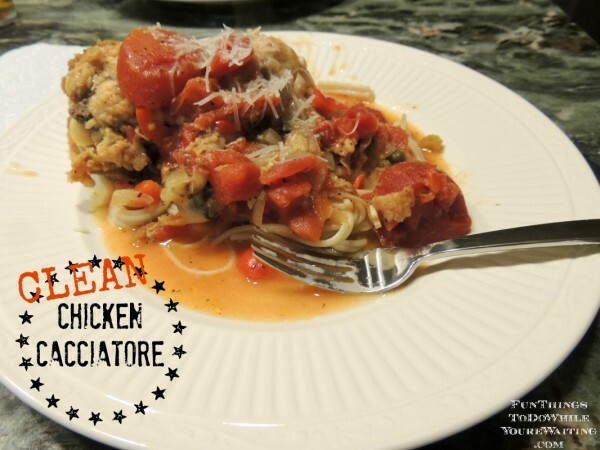 Chicken cacciatore will absolutely make appearances on our menu throughout the year! And not only did Bub and Baby Bub agree on the delightfulness of my debut of chicken cacciatore but Big Daddy did too! 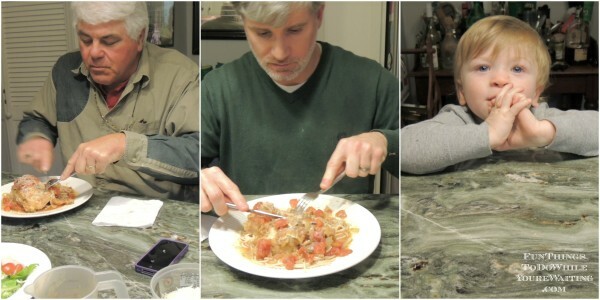 I served it over brown rice pasta- the boys were none the wiser that it was any different than normal. Add tomatoes with juice plus broth, capers and parsley. 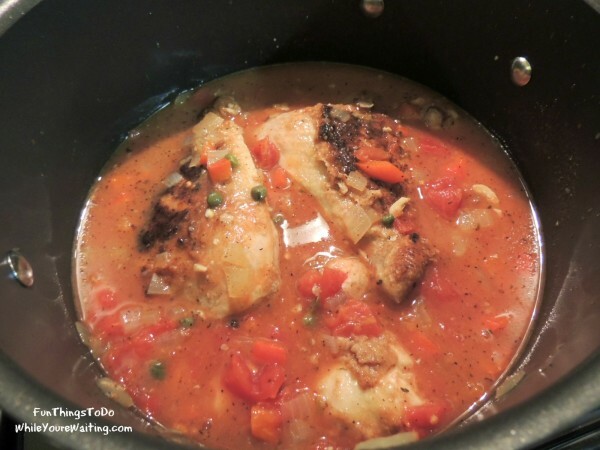 Return chicken to sauce and allow to simmer for 20-30 minutes until chicken is fully cooked. 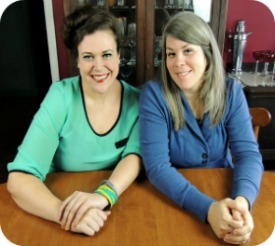 Has your lovie dovie ever requested a meal you’ve never heard of? What did you do? Did you go to bat? Or did you tell them they had lost their mind? Guilt Free Chicken Patties Fresh From Your Comfort Zone. (Clean) Bacon & Ranch Crockpot Chicken Homemade Almond Flour Encrusted Chicken.